Herbs often have medicinal, relaxation, and culinary properties, and it is great if we can have them throughout the entire year in the home. In fact, we can! We will reveal a way to grow certain herbs in the kitchen and provide a pleasant flavor in it. What best about it all is that you do not need to water them regularly, nor change the soil, and they will be still as flavorsome as if grown in the garden. Yet, you will need to sow dill, mustard and cilantro seeds in a soil and then transfer them to water, as a soil herb cannot be transferred to water as the roots are different from the water roots. Put some herb cuttings in glass bottles with plain water, and it is best to use spring water if possible, as it is high in minerals. You should not use chlorinated water, as the bleaching chemical can damage the plant tissues. You should leave some tap water to air overnight or store some rainwater. 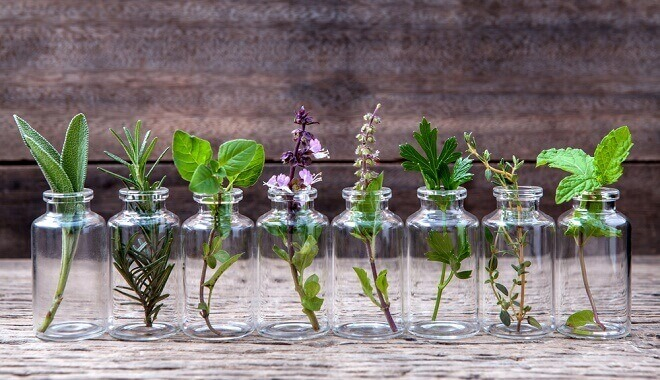 Choose a glass bottle, a mason jar, or even a plastic bottle for the herbs. Yet, use colored bottles or warp a piece of paper around the bottle as the roots should not be exposed light. The darkness will help you avoid algal growth on the bottle and on the root. The narrow-mouthed containers support the cuttings and keep them upright. Yet, avoid narrow or tight-fitting ones as the mouth of the container should support a free transition of air for the roots to be able to breathe. You should pick soft cuttings roots, and cut some 6-inch sections from the growing herbs. Put them in the containers and remove the lower leaves as they can rot in the water and spoils it. You can change the water once a week in the case of herbs like rosemary cuttings. As soon as the roots start growing, within 2-6 weeks, you do not need to change the water. To stimulate the rooting, place some willow branches in warm water overnight, and then use them as a soothing hormone mixture. You can use some rooting hormone powder as well. 1. Rosemary – The root of the semi-woody cuttings of rosemary need more time, but the new shoots in the spring grow faster. Keep the plant in a sunny spot. 2. Sage – You should take some sage cuttings in the spring and place them in water. Place the herb on a bright spot in a well-aerated place as it is prone to mildew. 3. Peppermint – This herb is high in the volatile substance menthol which provides a cooling sensation on the skin or tongue and does not change the temperature. Just put a few fresh cuttings in water, as it is the easiest herbs you can grow in water. 4. Tarragon – You need some spring cuttings after new growth appears, and place the herb on a warm and bright place. Tarragon can be of various types, and the French one is best for culinary purposes while the Russian is better to be used for salads. 5. Basil – This herb is easily grown in water. Place the cuttings in water before they start flowering and place the container in a sunny place. 6. Spearmint – Peppermint is a natural hybrid of spearmint and it is easily grown in this way. 7. Thyme – Take some newly grown, green cuttings, in the mid-spring or early summer before the thyme starts flowering, place them in water, and spray the parts which are under the water to avoid its drying. As soon as it is grown, cut the stems to boost branching. 8. Oregano – Place the fresh cuttings of oregano in water and pinch the growing tips as the herb grows. 9. Lemon Balm – You should pick several cuttings in spring or fall, and place them in water in a bright spot. After 3-4 weeks, the cuttings will develop roots. Change the water often, or you can keep the plant outdoor if the weather is warm. You can prepare tea from the leaves. 10. Stevia – You can add stevia to some beverages and teas. Just place some stevia cuttings from actively growing branches in a container full of water, and keep it in a sunny and warm place.